Hawthorne was a brand of Montgomery Ward stores. Most Hawthorne bicycles were manufactured by the Cleveland Welding Company or H.P. Snyder (makers of Rollfast bicycles). While Montgomery Ward did not actually manufacture the bicycles that they sold, they did commission some unique designs that were exclusive to their stores. One of the most desirable of these is the 1936-1939 Hawthorne ZEP. From 1940-1941, they sold the American, a bike designed by famous industrial designer Walter Dorwin Teague. They were so proud of this that they even used his name to advertise the bike. In the 1930’s, Montgomery Ward commissioned the Monark Battery Company (later Monark Silver King) to build a line of aluminum bicycles based on Monark’s own line of aluminum bikes. The Hawthorne versions were dubbed the Duralium, and differed only slightly. These are very sought after by collectors today. Many Hawthorne bicycles share a lot in common with other bicycles built by the two primary companies, Cleveland Welding, and H.P. Snyder (Rollfast). Most parts are interchangeable, so restorations are a lot easier than if you were dealing with something exclusive. This can also make identification of a Hawthorne bicycle difficult if it is missing it’s badge or other unique identifying components, such as the sprocket. There are no publicly available serial number records to help us identify the build date of Hawthorne bicycles. Dedicated collectors have compiled serial number lists that can help them approximate a build date, but no official or published list exists. Instead, we are forced to use the original published catalogs from Montgomery Ward to identify the year and model. Fortunately, a reprinted book containing catalog pages from the 30’s through the 60’s is available. Click here to find one on eBay. Search eBay for Hawthorne bicycles and parts. 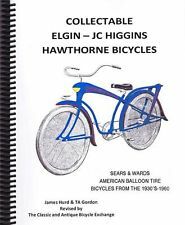 Search Nostalgic.net for Hawthorne bicycles and literature. Vintage Rare Original Hawthorne Bicycle Red Reflector Chrome Hub Caps-red Jewel!